1. CLICK HERE to find participating shops in the resource section on Northcott.com. 2. Physically visit participating shops Sept 9 -21, 2017 to collect the free block patterns designed with The Pony Express Collection and get shop stickers for your Block Party Postcard (each shop provides one free block pattern and one unique shop sticker). 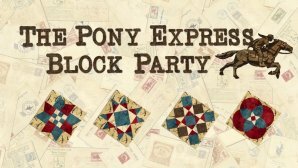 Participate in the Pony Express Block Party by creating a quilt for a chance to win! Consumers can further participate in the Block Party by creating a quilt for a chance to win. Participating quilts must have a minimum of 6 blocks from 6 different shops in each quilt (block patterns can be from the same state). • Photo submissions must be sent to submissions@northcott.com. Contestants will need to include a photo of their quilt, their name, address, phone number, and the name of shops whose blocks are included in the quilt. • Deadline to submit a photo of a finished quilt is November 4th, 2017. • The top 5 finalists will be required to send their quilts to Northcott. (Northcott’s judging criteria and complete challenge details will be available on Northcott.com). • The 5 finalists will be featured on Northcott’s social media platforms for consumers to vote for a national winner. • The winner will be announced on December 11th, 2017.